Lift-up safety support made of tube and supports in stainless steel AISI 316L diam.32 mm. Depth 700* mm, height 200* mm (* max outer dimensions). The plate for the fixing to wall is provided with a nylon interior plate. 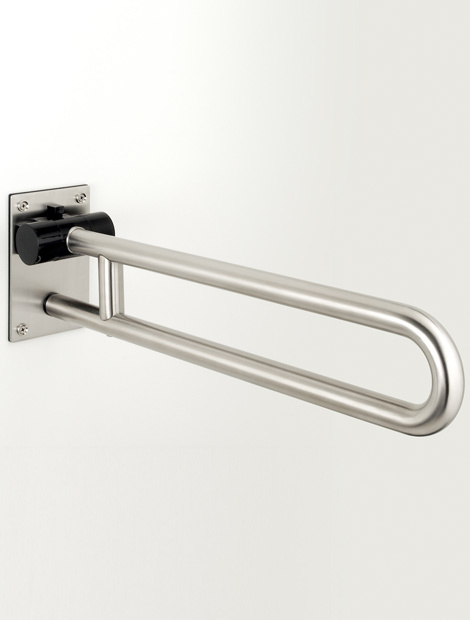 The mechanism is made of nylon-covered die-cast aluminium alloy and has a spring-system enabling the handle of the arm with a minimum effort and avoiding its fall. Fixing set as free outfit for concrete, natural stone, solid brick. It does not need grounding.